Cancer is a disease of the tissue, not of the cell, let alone, of the gene. The latter is the official dogma and did not get us very far. Cancer is a wound that never heals, a regeneration that fails to stop. Treatment that slaughters cancer cell populations (thus, essentially all treatments except immunotherapy) further damages the cancer tissue which further stimulates an abnormal, never-ending wound healing process: generation of more abnormal cancerous stem cells that keep dividing. So why add injury to injury with treatment that kills cells? It perpetuates a vicious cycle. Recognizing that cancer treatment can be a doubled-edged sword that shrinks the tumor while promoting cancer progression will open a new vista on new treatment strategies that stop the vicious cycle. What do all (non-surgical) cancer treatments, be it radiation, chemotherapy, or modern targeted therapy or even the latest immunotherapy have common? Answer: They seek to kill the cancer cells. But there is another commonality: They also all fail to eradicate the tumor most of the time. If we are brutally honest with ourselves, these conventional treatment strategies essentially do not work. But wait, wait: this is not yet another quackery opinion about how conventional chemotherapy is just “poison”. It is about the latest rigorous research results and biological thinking. There is a much more subtle aspect to brutal mass-killing of the cancer cell populations that I will explain here. Understanding it will change how we think about cancer therapy and help explain the occasional stunning successes of immunotherapy. We are quite good at developing cancer drugs that can reduce tumor size by killing cancer cells. However, what kills the patient is not the primary tumor but the recurrent tumor and metastasis. After the initial regression to barely detectable size (“complete pathological remission”, CPR) the tumor can regrow from the cells that survive the treatment and then metastasize. The recurrent tumor is almost invariably more aggressive and harder to kill; its cells are now therapy-resistant. Many things in life are not 100% but that does not matter: A glass that is “99% full” is essentially “full”. Getting 99% of the questions correct in an exam is a splendid achievement. Killing 99% of the enemy soldiers affords a decisive victory in battle. Not so in cancer treatment. Here we need a 100% kill rate. A tumor of the size of a pea (1g or 1cm3) may contain 10E9 (one billion) cancer cells. Killing 99% of the cells that it contains is actually not a success: you are left with 1% of surviving cells, which still corresponds to a whopping 10E7 (ten million) cells which can divide and multiply, driving a near-exponential re-growth of the cancer cell population. One reason why it is so hard to kill 100% of cells is the enormous heterogeneity of the cancer cell population with respect to the intrinsic drug-sensitivity and accessibility of individual cells. But all is not as simple: why are recurrent tumors almost always MORE malignant (=“tumor progression”) and why do they also exhibits therapy-resistance, precluding that doctors simply re-apply the same treatment again and again? The old thinking was that the cells that survive the first treatment and regrow are cells that carry pre-existing chance mutations in their genomic DNA that make them inherently therapy-resistant. Because of this Darwinian selection, therefore, more and more potent drugs must be developed and deployed — so goes traditional thinking. But that is the wrong strategy. Darwinian selection could explain why cells become resistant –but why are cancer cells of recurrent tumors more aggressive, that is, more invasive and migratory? Why are they more resilient and versatile, resembling stem cells (=the normal cells in the tissue from which regeneration occurs)? This will become automatically clear later. In life when we only achieve partial success in any task, for instance scoring not 99% but much less than 100% in a test, or killing only an insignificant fraction of enemy troops, the reflex is that we will need to double-down: We work harder or deploy more troops and more powerful weapons. Unfortunately, currently the sole strategy in cancer research applies the same principle: We double-down by developing more and more potent drugs that act with higher precision to target the mutated cancer cells. But instead of doubling down, it may be good to back down and rethink our strategy. Why? We now learn that, despite prevailing dogma, new mutations are not the sole culprit for tumor progression, as cancer DNA sequencing increasingly suggest. But if so, the most powerful “precision medicine” drugs would be blunt — because the 1% or even 0.1% surviving cancer cells are not just “inherentlymore resistant”. They become an entirely different animal after having gone through a near-death situation imparted by the initial cell killing (“cytotoxic”) treatment. This qualitative change in the remaining tumor is the consequence of two processes: (a) First, conventional cytotoxic drugs or irradiation cause cell stress, which activates stem-cell functions that normally serve to initiate regeneration but in cancer cells only produces more “cancer stem cells”which instead can (re)initiate a tumor. (b) Second, the treatment damages the tumor tissue as a whole, leaving behind a battle-field littered with dead cells, which we call “cell debris”. Instead of zooming in on the genetic mutations within the cancer cells’ genome, let’s zoom out. Let us consider the tissue micro-environment of the cancer cells in a tumor. 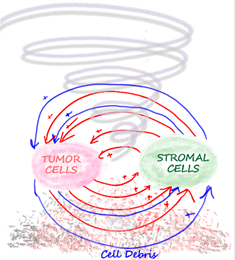 The non-mutated “normal” cells surrounding the cancer cells, which comprise the so called “tumor stroma”, are not innocent bystanders in tumor development and progression. But they become (un)willing co-conspirators that nurture the initially tiny “dormant” tumor into a vigorously growing tumor that is clinically manifest. Thus, cancer is not simply a disease of incessantly dividing mutated cells that cause the tumor to expand and “take-off” as its tumor cells exponentially multiply. Cancer is even less a “genetic disease” as many textbooks present it. No, for many years now, it has been recognized by academics (but rarely acted on by practitioners) that cancer is a disease of the entire tissue, and is comprised of a heterogeneous population of a variety of cancer cells and of non-cancerous supporting cells: immune cells, including its first line defense cells, the macrophages, as well as blood vessel cells, and cells that normally constitute the structural framework of organs: the “fibroblasts”. Such cells are attracted to the clump of tumor cells and they are mixed in with the malignant cells. These non-cancerous “stromal cells” are recruited by the tumor via chemical and mechanical signals and become activated. They begin to communicate with each and with the tumor cells via a network of precisely wired communication channels. The tumor is not just a clump of cancer cells (pink). It takes a village to grow a tumor. The village consists of the stromal cells: Immune cells (light blue), blood vessel cells (purple) fibroblasts (green) and others. The red arrows are the communication lines between the various cells — embodied by a large array of various ‘micro-hormones’ released by specific cells and addressed to specific cells. Information is exchanged via a large array of specific signaling molecules secreted by cells: the so called “cytokines”, growth factors, small peptides and lipid autacoids. These “micro-hormones”, as we shall call them altogether, are sent by cells of one type, and addressed to specific cells of other types that carry the receptor molecule for the respective signaling molecule. These signal carry an instruction for the receiving cell to change its activity in particular ways, for instance, to increase cell division rate. A complex inter-cellular communication network thus is erected that coordinates the action of all the stromal cells and that also stimulates tumor growth in a concerted manner. This is the support from its tissue environment that the tumor needs to grow. Many of the more avantgarde cancer researchers have thus long proposed apt metaphors: the tumor is a new (pathological) organ. It takes a village (of cells) to grow a tumor. Here, we will take one more step into the metaphorical to explain a complex process. Mutated cancer cells alone, without the help of the activated stromal cells, often stay silent in the tissue as harmless, dormant or “occult” micro-tumors for decades, and do not “take-off”. This is akin to the many nascent hurricanes in the Atlantic, many of which never make it to become full-blown hurricane that call our attention but instead die off while still above the Oceans because conditions for the self-reinforcing vicious cycles of warm air and low pressure are not met. 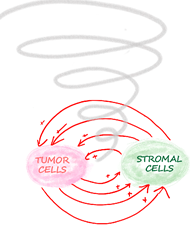 But there is more to this similarity: tumors also require a vicious cycle of reciprocal causation: Only when the network of stromal cells and the tumor cells establish a relationship of mutual reinforcement, where stromal cells stimulate tumor cells and tumor cells stimulate stromal cells, thus creating a self-propelling vicious cycle of reciprocal activation, will the mutated cells drive the net growth of the tumor. Unfortunately, the general phenomenon of bidirectional causation and associated “non-linearity” lies outside the domain of comprehension of the linearly thinking scientists that dominate in the community of cancer researchers. But dealing with such non-linear mutual causation confronts us with this question: How does the self-sustaining chicken-egg system get started in the first place? What triggers the attraction and activation of immune cells and the other stromal cells to build this self-propelling, growing society of communicating cells that lock-in the tumor in a robust expansion mode? Rudolf Virchow, the German pathologist and father of scientific medicine proposed more than 100 years ago that the tumor is a wound that does not heal. Wound healing is a very complicated process. It is initiated by tissue injury, a damage of the specialized cells in the tissue (e.g. skin cells, liver cells etc. — that are the building blocks and the functional elements of organs) and the associated disruption of the highly ordered tissue architecture by a mechanical or chemical injury or an infection by a microorganism. The lesion of cells and the destruction of the nicely layered cell arrangement triggers the attraction and activation of an army of immune cells to fight the infectious agents. Blood vessel cells also migrate in the zone of damaged tissue to form new capillaries and nearby fibroblasts proliferate, thus providing the logistical and structural support for tissue repair. This process of increased blood and cell supply is known as inflammation. Along with inflammation, the nearby specialized cells of the tissue are converted into immature stem cells which then (along with resident tissue stem cells) regenerate the damaged tissue. Now we can see: all those non-cancer cells of the “village”, which we said above supports tumor growth, are part of a (pathological) version of a wound! In normal wound healing and regeneration, these tightly coordinated cellular processes of inflammation come to an end when the invading agent is eliminated and the tissue damage is fixed. The complexity of wound healing program includes the central but of neglected feature of being self-limited. Once the damage is contained, the immune response is suppressed, growth of new blood vessel ceases, and the army of inflammation cells retreats. The tissue stem cells differentiate and mature to functional tissue cells and thus, regeneration stops. As we will see, of crucial importance, but often forgotten, is that in this stage specialized immune cells, the “clearing macrophages” (a subtype of macrophages), arrive and eat up the cell debris (from the dying cells) to clean up the battle zone, and the tissue heals –restitutio ad integrum. Because inflammation drives diseases and cause pain, much research has been devoted to understanding what starts the inflammation and what drugs can block it. But very little is known as to what ensures the self-limiting nature of normal wound healing — the process now referred to as “resolution”. Because of resolution, a normal wound healing does not enter the endless vicious cycle of mutual stimulation by its component parts. In the tumor tissue, as Virchows suggested, a wound healing-like process also takes place. It is thought to be triggered by a local disruption of the tissue architecture by the dormant micro-tumors along with the abnormal biochemistry of the malignant cells that is sensed by the tissue. In fact, disruption of the “glue” (matrix) that separates the specialized organ cells (epithelium) from the stromal infrastruture (where the fibroblasts reside in the normal tissue), followed by a pathological overproduction of a thick matrix is often the very first tissue reaction and perhaps the very first step of malignancy –at least from the unorthodox point of view of a tumor as a disease of the tissue. This increased tissue density is what is detected by mammography in the case of breast cancer. But additional tissue damage of unknown origin, perhaps due to chronic irritation, likely contributes to wound healing activities surrounding the tumor –creating the village of cells that is required for tumor growth. ·  First, since the growing tumor further destroys the tissue architecture, it embodies eo ipso THE tissue damage with all the consequences: it triggers the inflammation which in turn stimulates the conversion of cancer cells to cancer stem cells which proliferate robustly following their inborn instinct to replace damaged tissue. But they do so not faithfully following the architectural needs of the tissue because these cells are mutated. This uncoordinated growth in turn causes further tissue destruction, which further provokes repair mechanisms — a strong vicious cycle. ·  Second, the stromal cell reaction in this abnormal inflammation is poorly orchestrated; the inflammatory cells recruited to the site of damage are akin to an army of soldiers entering into the battle following an attack signal but incapable of hearing the signal for retreat in the cacophony: inflammation does not resolve and the wound cannot heal. ·  Finally, not only do cancer cells multiply rapidly, but they do so more than the new blood vessels can sustain. Running out of oxygen many cancer cells die (even if many cancer cells, notably the cancer stem cells, become specialists for survival in low oxygen). The tumor tissue is thus littered with dead cell bodies, the debris. And this debris material itself, by exposing the inner content of cells to the tissue, represents one of the most potent stimulator of inflammation. This is biologically plausible: What stronger an alarm signal of destruction is there than dead cell bodies and the release of the cells’ entrails? In many organisms and in many tissues, death of the cell will trigger the neighboring cell to briefly become a stem cell and divide to fill the gap, the machinery of self-repair that guarantees tissue integrity. But in tumors, this regenerative process is uncontrolled. In fact, experimental injection of dead tumor cells into small tumors grown in mice can boost tumor growth by up to 100-fold, as long known and as more recently shown for many ways of producing dead cells, with a variety of drugs and for a variety of tumor types. Thus, unlike in normal tissue, if the continuously generated cancer stem cells in tumors are the seeds, then the stroma is the soil, continuously fertilized by inflammation and dead cell debris. No wonder, with this self-seeding and self-fertilizing, the tumor is a wound that does not heal, and a regeneration that does not stop. It has only one fate as a whole system (despite cell death): to expand and progress to higher malignancy. We started with a logical deduction –an intellectual process that many cancer researchers have abandoned in favor of a blind chase for new cancer-driving mutations as explanation of the dreadful nature of cancer. We can now follow up with another logical deduction: treatment kills cells, thus it will increase the debris in the tumor, and debris in one of the key elements that spins the vicious cycle of mutual stimulation between stromal cells and tumor cells that drives tumor growth. 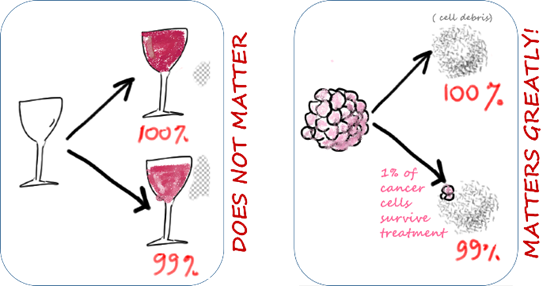 In a more refined mathematical analysis this scenario represents a so called “bifurcating instability” in which there is no middle ground, no grey zone (or very unlikely) , but a binary “either-or” outcome: (a) Yes, if we manage to kill the overwhelming majority of cancer cells (very close to, if not 100% of cells) then too little tumor mass remains to sustain the self-stimulating vicious cycle and the tumor will die away as a whole. (b) But if we manage to kill only much less than 100% of the cells there is sufficient tumor mass to be stimulated by the debris and inflammation, such that the very act of killing can, after initial shrinking of the tumor cell population, in fact stimulate the tumor. This seems paradoxical, but may the following metaphoric stretch be allowed here: human societies sometimes behaves similarly: Hiroshima and Nagasaki city reemerged with latency from the ashes after the nuclear bomb detonation to new glamour and are arguably more flourishing than before. Thus, cell killing tumor treatment adds injury to the injury that initially triggered the inflammation. This is exactly the scenario that Friedrich Nietzsche had in mind about human nature: What does not destroy me, strengthens me. This phenomenon of course applies to the war on terrorism, the suppression of political dissent, etc. as I wrote here. This Nietzschean principle that allows good people to reemerge stronger from life crises, that empowers bad guys after half-hearted attempts to contain them, that enhance resolve and resistance in those under attack, is also coopted by malignant tumors. It is the reason why the recurrence of tumor after treatment is not just the Darwinian selection of cells that happen to be insensitive to treatment but presents a different, in many ways more aggressive cancer. Unfortunately, the cancer research community has, in the otherwise laudable effort to find simplicity, evolved a culture that makes it blind to all kinds of complex processes that involve the non-linear dynamics that is at the core of any vicious cycle. Instead, the modern cancer researcher, unlearned in basic biology and untaught in the analysis of complex systems, suffers from the habitual assumption of linear causation and the associated doubling-down mentality, believing that more effective killing is always better. If cancer is a wound that never heals and if it is nearly impossible and too risky to aggressively seek a 100% kill rate (except in the case of the very uniform childhood tumors), applying a therapy based on the principle of mass-killing (but still unintentionally sparing many cells) will most of the time be a double-edged sword: the impressive initial remission (“shock and awe”) actually promotes later recurrence. If stimulation of cancer progression is built-in into the treatment, then no wonder that none of the drugs approved by FDA or by its European equivalent (EMA) in recent years for cancer treatment have prolonged life by more than a year (median survival). Yet, we keep doubling down by deploying more potent, more precise cell killing drugs, now under the mantra or “precision oncology”. So what are alternatives to the mass-killing of cancer cells with cytotoxic chemotherapy, precision drugs or irradiation? We present below two promising, scientifically plausible alternatives — one is a hot topic, and another one which is only emerging as an entirely new treatment modality of which most active cancer researcher have yet to hear. 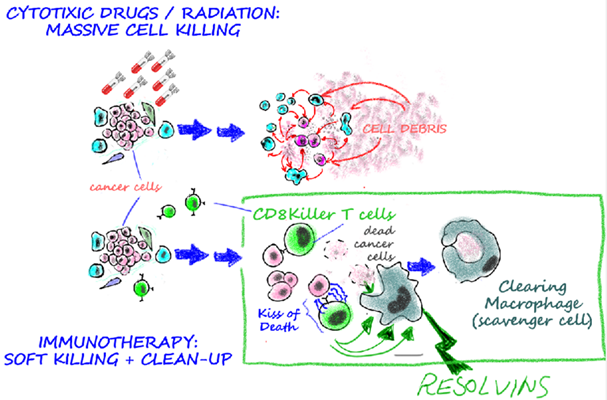 The first alternative to the mass killing of cancer cells by cytotoxic drugs, including the precision therapy targeting mutations, or irradiation is immune therapy. Although developers and promoters of immune therapy, the hottest cancer treatment fad at the moment, are agnostic of all the above theory of the consequence of cell killing and the vicious cycle, but instead hoped to simply harness the natural cell-killing capacity of the immune system as yet another way to kill tumor cells, they have picked up a wonderful weapon for the battle against cancer: The cytotoxic immune cells, notably the T lymphocytes (“CD8 T cells”, formerly also called “killer T cells”) are fundamentally different from drug molecules or the beams of irradiation. First, the immune system cells are living “kill vehicles”, and thus, much more powerful than any chemical or physical treatment –to an extent that one may hope that they could defy the double-edged sword nature of cytotoxic drugs by killing nearly 100% of the tumor cells with minimal collateral damage. 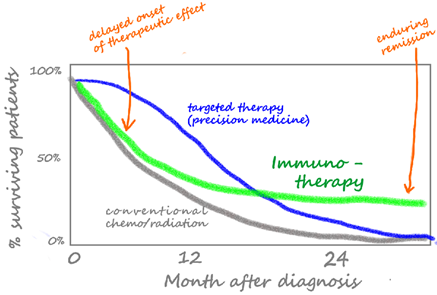 After all, therapeutic agents of immunotherapy, such as the CAR-T cells and other genetically engineered T cells, or the body’s own anticancer T-cells awakened by a new class of drugs (“check-point inhibitors”) can, unlike chemicals, actively multiply and migrate to chase the tumor cells far into their tissue hide-outs –potentially killing many more cancer cells than the passively diffusing and inevitably decaying drug molecules. One central limitation in the deployment of immune system weapons is that one must know the precise barcode (antigen) that tumor cells carry on their surface and that is recognized by the immune system as abnormal or foreign in order to direct the immune cells to the cancer cells. Often we don’t even know whether the immune system is sensitized to recognize the tumor cells as foreign and to attack them. But there is a more interesting, oft ignored bright side of immune therapy, notably, the checkpoint inhibitor drugs which overcome the natural checks on the immune system. This new class of drug activates an anti-tumor immune attack by preventing the natural molecular breaks in the immune system from operating. These breaks (“check-points”) normally serve to avert the immune from running amok and destroying the normal tissue, the cause of auto-immune diseases. These breaks are coopted by the cancer cells to subdue the immune cells that may attack them. Assuming that the immune system is sensitized to regarding the cancer cells as foreign (which unfortunately is often NOT the case) and that the cancer cells are indeed already successfully suppressing an anti-cancer immunity, then (and only then) it is plausible that removing the check-points will activate the intrinsic kill machinery of the immune system which can be a wonderful weapon. Let’s assume now that we have such a fortunate scenario to see the neglected bright-side of immune therapy. Again, one must take the more holistic and encompassing view of biology that often escapes the narrow minds of cancer biologists and drug developers: By unleashing the immune system’s kill apparatus, a natural and biologically integrated process of cell killing is launched. The immune system kills cells in a way that is different from the brutal manner in which man-made agents slaughter cancer cells. The immune system does not engage in mass-killing but has evolved to gently kill infected or foreign-looking cells with minimal damage to the tissue. An immune killer cell (CD8+ T cell) kills the target cells slowly, one by one, by applying the “kiss-of-death” after double-checking that a given cell in the tissue deserves to be killed (because it carries the antigen signal). But most importantly, this process of soft killing comes with its own natural “vacuum cleaner” to remove all the dead cell debris produced by killing. The T-cells that perform the killing also sends a signal (still being studied by researchers) to attract the clearing macrophages, which in sync with the killing will remove the dead cells, thus initiating the process of resolution. The slow killing may explain why the tumor does not immediately shrink after administration of check-point inhibitor immunotherapy, but only after some delay. But then, in the unfortunately still small fraction of patients in whom the check-point-inhibitors work, the remission is sustained — and patients can be free of recurrence appears up to two years (so far). Now onto the second alternative to standard cell-killing treatment. Continuing our more encompassing biological thinking, one will readily see this plausible approach: Why not just artificially activate the resolution process along with cell killing? If tumor expansion is fueled by the vicious cycle in which incessant inflammation is sustained by continuing production of dead cells — why not disrupt this cycle by removing the debris, which is the source of or at least propels inflammation? Can we combine conventional cell killing therapy with a therapeutic activation of the clearing macrophages? That way we would not depend on the T cells which require that the cancer cells are immunogenic (carrying an antigen that stimulates the anticancer activity of the immune system) — a requirement for check-point inhibitors to work. What is it that the inflammed tissues releases to activate the army of the clearing macrophages? In the 1970s, Charles Serhan, now at Harvard medical School, and Bengt Ingemar Samuelsson at the Karolinska Institute in Stockholm discovered a new group of lipid-derived micro-hormones that they would eventually call “specialized pro-resolving mediators” or SPM. Samuelsson had already discovered the prostaglandins, the lipid micro-hormone that causeinflammation and whose synthesis is blocked by aspirin, for which he received the Novel Prize in 1982 (along with S. Bergström and J. Vane). SPMs turn out to be a sort of opponents of the prostaglandins; they are at the heart of the self-limiting nature of inflammation. Ensuing studies of the biological message that SPMs carry in the cell-cell communication network of the stroma (red arrows in the Figure of the “Village of cells” in section 2.) suggest that SPMs activate the clearing macrophages –a subtype of scavenger immune cells (turquois in above figure) — to gobble up the cell debris. Interestingly, clearing macrophage act discretely, that is without releasing inflammation and tumor promoting signals. Thus, they embody to the mutual checks that balance the mutual stimulation in the dense interaction network of the “village of cells”. One prominent family of SPMs are termed RESOLVINS, which are derived from the omega-3-polyunstaurated fatty acids (omega-3 PUFA), including EPA and DHA, that are famously found in healthy diet. In fact, the health benefits of omega-3 PUFA have been attributed to the anti-inflammatory effects of the SPMs and active research is still going on at this front. It is not entirely clear to what extent eating diet rich in omega-3 PUFA, including EPA nd DHA results a relevant increase in tissue levels of resolvins that could be protective against prolonged inflammation. But a recent large-scale study in mice carrying a variety of cancers showed that administration of resolvins has a drastic anti-tumor effect –notably in tumors set-up such that their growth is demonstrably fueled by dead cells from chemotherapy. In view of the tumors’ Nietzschean response to treatment it is only natural that patients and advocates ask: If cell killing treatment (that is, essentially all forms of therapy) can promote instead of suppress cancer, should patients then receive cancer therapy with radiation, chemotherapy or targeted therapy at all?Clearly, forgoing traditional treatment is NOT an option at this moment. There is no question that cytotoxic or targeted treatment has at least short-term benefits –if only to “debulk” the large tumor, which can anatomically and biochemically cause secondary medical problems, or to facilitate surgical removal. If treatment has a cancer promoting effect it would be hidden behind the net benefit seen across a cohort of patients in clinical studies. In other words, the double-edged effects prevented a theoretically better outcome (across a patient population) that is impossible to extract in current schemes of clinical studies. But biologically there is the possibility that in some tumor constellations, as discussed above, we are lucky and the kill rate is so large, perhaps very close to 100% of the cancer cells, such that a massive reduction of the number cancer cells leaves barely viable cells behind that would benefit from the principles that “what does not destroy, strengthens”. For, if too few cells are left that are converted to cancer-stem cells by the additional tissue injury imparted by cytotoxic treatment, there is no sufficient critical mass of cancer cells for regrowth. This may be the case in some childhood tumors where the cancer consists of rather uniform cells that carry few mutations and have a high tendency to differentiate –the process that converts the stem-cell state into the mature functional cell state. For instance, the standard therapy of a form of childhood leukemia consists of aggressive “remission induction therapy” to eliminate as many leukemia cells as possible, followed by prolonged “maintenance” chemotherapy at lower dose. 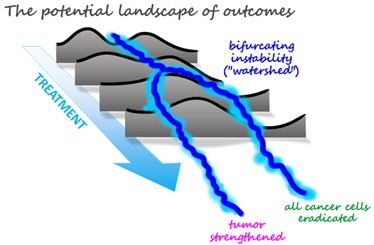 The detailed scheme for treatment decision is complex and depends on many factors, including the nature of the mutations in the cancer cells that in theory would determine whether there exists an open path (chreod) for the cells to enter the differentiated state so us to recapitulate healthy, self-limited regeneration. The reason why in some childhood tumors an intervention can end up on the favorable side of the binary watershed/double-edged sword scheme, and thus trigger tumor collapse as opposed to stimulating its progression, as is the case of majority of adult cancer, remains a mystery. Does such a window of opportunity within the fateful catch-22 situation of treatment in adult tumors exist at all –but we have not yet found it? 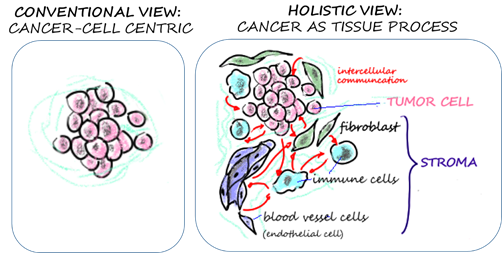 Unfortunately, most adult cancers have a too heterogeneous cell composition; this diversity of cells itself will allow a larger number of cells to survive the initial treatment, providing a robust playing ground for the Nietzschean principle to operate and to start the vicious cycle of the wound that does not heal. There is a more encompassing category of thought that cancer researchers must learn to embrace from observing the binary Nietzschean response to treatment –either tumor dies or it is rendered stronger but little in between (see watershed figure in section 4): The possibility of a preordained “either-or” nature of outcomes when dealing with complex systems. Every interference with our body, with ecosystems and societies, or with any complex system of many interacting parts that dance the tango of mutual stimulation and of mutual checks, thus creating layers of vicious cycles but also of reciprocal constraint, is a double-edged sword. Such a system cannot NOT respond. It HAS to respond either favorably or unfavorably (from the interferer’s point of view). Overcoming such robust, regenerative, sensitive systems is not a zero-sum game in which partial victories add up, inviting a doubling down of our attacks. You can not just send more troops to finish of the enemy. This reminds us of fighting the multi-headed Hydra of Lerna in Greek mythology: with every head you chop, new ones growth. The regenerative power exceeds the damage of injury most of the time — but worse it is s further stimulated by the damage — unless you manage to kill them off with a massive lethal blow at once (as is perhaps what happens with the curable childhood cancer). OK, back from concrete metaphors to some more abstract theory: As said now many time here — the mind of cancer researchers, like that of most biomedical scientists, unfortunately operates in a realm of simplistic, linear thinking in which linear causative relationships, e.g. “A causes B”, are used to explain the world. “A is the root cause of B” . Hence A needs to be eliminated to avert B, the undesired state, e.g., a disease state. But this is not how complex, multi-component, networked and multi-layered systems, such as tumors, the body, or human societies function. So called non-linear interactions among the component parts are mathematically the key ingredients that create hidden instabilities: they poise a system at watersheds which forces our intervention into becoming doubled-edged swords. Such systems exhibit two opposite self-propelling outcomes –tumor eradication or tumor promotion. In this framework, it becomes obvious how primitive the idea is of just eradicating the root cause (the malignant cells and even worse, the mutations they harbor). We must not be tricked into generalizing from the few fortunate cases where such primitive causal thinking has been successful. Ironically, with modern immunotherapy we may have inadvertently entered the realm of the more holistic modulation of tissue processes that (in unintended ways) avoids the detrimental therapeutic wounding of the tumor tissue. Often in the history of medicine a treatment works (even if only partially) not for the reasons we think and we need to be aware of that. Unfortunately, in an act of intellectual complacency we rejoice at the superficial elegance of using immune cells as life kill vehicles and thoughtlessly follow the appealing fashion of immunotherapy. Currently hundreds of millions of dollars are committed to blindly test immunotherapy in over 800 clinical trials with minimal variation on the theme, minimal biological reasoning about the enormous intricacy of the immune response. In this echo chamber of simplistic ideas that ignores complexity and non-linearity, we may miss many opportunities for widening the narrow window for successful outcomes: To actively tilt the balance of the double-sword effect of therapeutic intervention, away from provoking tumor progression and towards restoring a quiescent tissue by soft killing and controlled elimination of cancer cells. The lever to do so is what “precision medicine” should identify and operate — not just that for “precision killing”. Along with vitamin C chelation, consuming more vitamin C-rich foodsmay also prevent and fight cancer.